This pair creates my coveted "wall of yum," or long-lasting veil of yummy scent. Heure Exquise on its own doesn't quite do it; it's a lovely, powdery scent, yet Neroli adds an acidic quality that keeps Heure... from becoming a bit too bland. As I've mentioned before, it doesn't bother me to layer. I've used Etro Heliotrope as a "base" for many perfumes; it mellows and sweetens them. Passion, and Les Nuits d'Hadrien EDT, have been knocked off my list. Passion just is not "me." It doesn't smell as sweet on my skin as I'd like (conversely, it might suit you if you're looking for something "not too sweet"). Les Nuits... eau de toilette was very light on me. Having sampled the eau de parfum, I can heartily recommend that, but imo the EDT should have been stronger. What does Heure Exquise smell like? It's basically...powdery. In a sense it's like many powdery scents I've smelled, only it is better in not being a completely generic powdery scent. I loathe generic powdery scents...sometimes a good one can stand alone, but still I prefer the combination. It doesn't smell distinctly of any one of these notes; it's quite well balanced and blended. 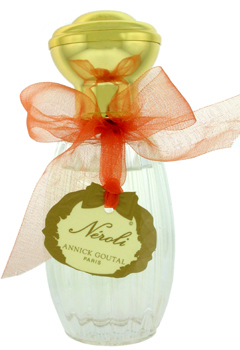 Of the AG samples I got this time, I think I like this one, and Neroli, the best.